Why use a specialist management company like RNCE? Traffic management, traffic planning and traffic control is far more sophisticated than it once was. 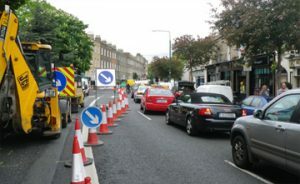 Codes of Practice and Irish Legislation continue to raise not only awareness but considerations for safe implementation of traffic management, traffic planning and traffic control on work sites. Richard Nolan CE as a nationally recognised provider of traffic management, traffic planning and traffic control and prides itself on exceeding the Codes and Standards that govern our industry. With “Safely Managing Risk” as our primary objective to our client and as importantly the delivery and management of our service, this is why Richard Nolan CE should be your #1 choice. Traffic management and traffic planning implemented by traffic controllers previously held the stereotype of workers with little else to do. Not only is this unfounded but dangerously mislead as the actual risk minimisation that Richard Nolan CE provides keeps all road users safe. Implementing any safe traffic management, traffic planning and traffic control scheme requires qualification and experience. From the initial traffic management planning through to the provision of traffic control, wrong advice or implementation can you leave you significantly exposed. This can be through fines, job shutdowns by authorities and significant penalties should your business find itself in litigation. Richard Nolan CE can manage your site to minimise your risk. Richard Nolan CE protecting YOUR employees. Richard Nolan CE’s purpose is to protect your employees and equipment so the only thing on your mind is your job. The last thing your business needs to worry about is the traffic management, traffic planning and traffic control. Traffic controllers continually assess the site conditions to ensure the site remains safe at all times. Ask yourself: Are your workers in a safe environment? How are they affected by traffic? Are employees concerned about their own safety? Do your employees wear reflective clothing and safety vests? Richard Nolan CE protecting the Public. Do pedestrians have a safe, unrestricted path around your worksite? Is the road or footpath left in a trafficable condition when your employees have finished work? Is the traffic condition message clear? Giving road users and pedestrians clear, legible, well signed work zones is crucial in minimising risk and potential injury. Utilising Richard Nolan CE will ensure the correct and code compliant signage is used to advise, define and direct all traffic through or around a work site. It is essential that all equipment conveys a clear message which is easily understood. Traffic management, traffic planning and traffic control is more than putting up a few signs and placing a couple of traffic cones here and there, it’s safely managing risk and reducing liability. Richard Nolan CE’s vehicles are equipped with code compliant warning flashing lights and used at all times. Vehicles without the necessary equipment are potentially increasing risk to your business. RNCE’ traffic controllers have the proper equipment and attire for all site conditions – day, night, wet weather etc. Richard Nolan CE controllers are fully accredited providing experienced and professional traffic controllers for each job. Do not underestimate experience, Richard Nolan CE doesn’t. Richard Nolan CE uses retro reflective class 2 signs, ensuring your site complies with the Chapter 8 Standard. Superior Auto Cad design software is used that ensures fast approval from local authorities. Engaging Richard Nolan CE should not be a question of whether you can afford it but whether you can afford NOT to. Good traffic management, traffic planning and traffic control ensures that the public and your staff are safe. It doesn’t matter whether you are hauling cables or laying DBM, Richard Nolan CE manages anything that is considered a risk. • Experienced and qualified staff. • Traffic management risk assessment and consulting. Traffic management and traffic control is the safe movement of motorists and pedestrians around worksites using, temporary traffic signage, delineators, arrow boards and accredited traffic controllers. Traffic management, traffic planning and traffic control is required by any business planning to operate on or near roads or pedestrian access ways. Richard Nolan CE is a specialist in traffic management, traffic planning and traffic control to reduce risk to the public, our clients and other stakeholders. A responsible contractor will recognise the value of engaging the services of an industry leader like Richard Nolan CE to safely manage the risk. Poor traffic management and traffic control can result in fatalities on site with recent judgments in the courts awarding hefty punitive damages for incorrect signage and control systems. This has come about by businesses not experienced in traffic management, traffic planning and traffic control failing to comply with the most basic of standards and codes. The more complex sites in high profile areas and on busy arterial roads need even greater attention to detail to reduce the risk to your business. Traffic management plans (TMP) are an integral part in the delivery of traffic management and traffic control services. As traffic flow increases, so does congestion and therefore the likelihood of traffic accidents. Councils and roads authorities require professionally prepared traffic management plans (TMP). 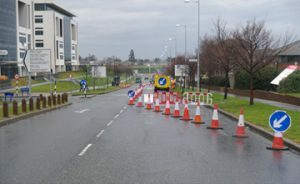 These plans are normally required before the council or national road authority issue assessments and permits to work on the road (authorities across Ireland can vary in their requirements). RNCE designs and produces temporary traffic management plans (TMP) for 1-6 road level LASNTG-LANTRA Cetrified for your specific traffic management needs. These may be for a simple one-day, single-lane closure, or they could be as complicated as a multi-phase project which requires road closures and detours. RNCE’s traffic management plans (TMP) ensure safety and efficiency for you, your job site and the general public. • Obtaining relevant assessment / approval to perform traffic management works. Traffic management plans (TMP) are a critical tool to any traffic management site. It identifies key areas of concerns, distances, site specific information and more. Traffic management, traffic planning and traffic control are part of the process to working effectively on the road. The link to working legally on the road is the traffic control permit when required. Gone are the days when you can work in the street without a traffic control permit. Councils, National Roads authorities, HSA inspectors and An Garda Siochana will shut down jobs, issue Prohibition notices and levy fines against a contractor that does not hold a traffic control permit. Richard Nolan Civil Engineering Ltd will handle all required traffic control permits with the relevant authorities as part of our total traffic management, traffic planning and traffic control service. RNCE has an extensive database of key relationships with councils and road owners / authorities which has taken years to establish. Hoping you don’t get caught without the required traffic control permit while on site is tempting fate. Incidents of injury, vehicle accidents, fatalities and other damage in or around road work sites are rising. This means there has been a greater focus on safety by all relevant authorities. RNCE will ensure your site is safe with the required documentation so your business can carry out the works with piece of mind. • Demonstrating applicable insurance documentation.